Today, I have the pleasure of sharing an awesome guest post with you! For all it’s (many) faults, one of the things I absolutely love about our digital age is how we are able to connect with others in meaningful ways because of technology. I am in a small Facebook group for wives of pastors and when a friend posted a Children’s Bulletin she created, I knew I wanted to share it with you all here! I asked and she was so gracious to let me do just that! As she says below, you could print a few for your kids or a whole stack for your church! I’ve included the links to download the file at the very end of the post! But before you get there, here’s a little bit from Rachelle on the story behind the creation of this amazing and simple Children’s Bulletin she’s sharing with you today. Hi! My name is Rachelle and I met Cassie back when our husbands went to seminary together. My husband is currently the pastor of a small country church in the sticks of Pennsylvania. We moved here a little over three years ago and have been thrown into full time ministry and are just praising God for bringing us to this congregation who have loved us and accepted us with open arms. We have four children, ages 7, 4, 3, and 21 months. Our church encourages the children to be in the service and to participate as much as they can. So as parents, we are encouraged to train them. With my husband being the pastor, most of that has become my responsibility. We have a few families in our church who have been willing to help which blesses me and my children a lot. Now that my 7 year old son is getting older, I wanted a way to train him to take notes during the service. Our church did not have anything in place other than a blank sheet. 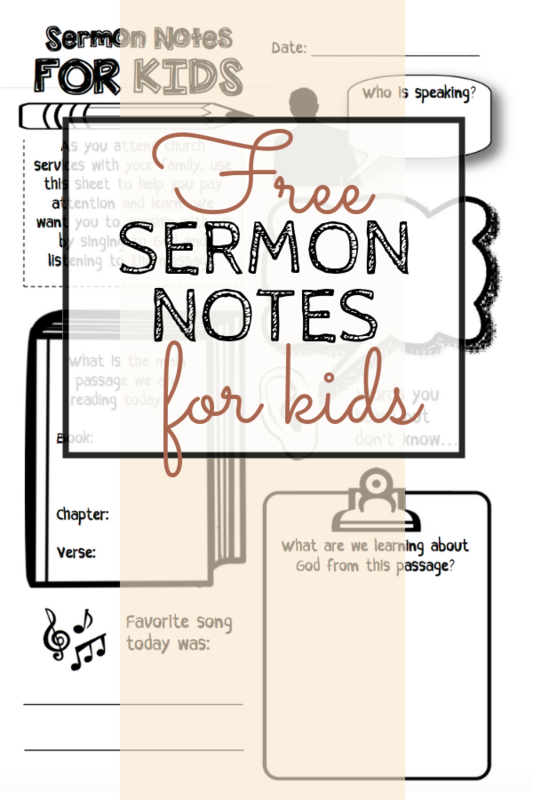 So I put together a fun way to help him engage with what is happening during the service and during the sermon by making a “Sermon Notes for Kids” page. We now have them provided at the church for any children that want to use them as well! I want this to be a resource that others can have access to as well so I am providing the pdf file for you to download and use for the benefit of your children or even for the children in your church. The file has two pages with the same layout on each page so that you can print it double-sided and then cut in half! I really hope this can become a great tool to help your children grow in their understanding and learning of what they hear during the worship service. Here is one of the first notes my son took. He still needed a lot of help with figuring out where to write, but I know over the years he’ll be filling in more and more as his understanding grows. And I’m so excited that I get to be alongside of him as he asks the hard questions and seeks to know God more. I truly hope this can be a resource that helps your family! I am so grateful to Rachelle for sharing it with us! It should be ready to print and go - just make sure (if possible) to print it 2-sided so that you can cut them in half and have just a half sheet ready to go! It will still work as a whole sheet, just a bit of a waste of paper and not as compact. You can download the PDF file by heading over to the Resource Library under the category “Children’s Church Resources”. I keep everything in the Resource Library so that it’s easy to download all the files you need (like a single download with 40 pretty Bible passages or lots of worksheets for the Children’s Catechism)! If you are an email subscriber, you can find the password in any recent email from me.